park was agreeably close to the motorway so there was little chance of our navigator getting us lost. We checked in at the park and after setting up camp we went down to the local information centre where we picked up several brochures with the intention of spending the afternoon working out what we wanted to see and do. The sky was clear with only a few wispy clouds and a light breeze was blowing later when we walked up to the barbecue area with our bottle of Two Tails Sparkling Wine to celebrate our arrival at another new campground. The night was cooler than I expected for this time of the year and it was a little overcast for our first morning but the clouds cleared before we were ready to leave and it looked like it would be a nice day. There were so many things that we wanted to see here in Canberra and we knew that four brief days wasn’t going to be enough. Not by a long shot! 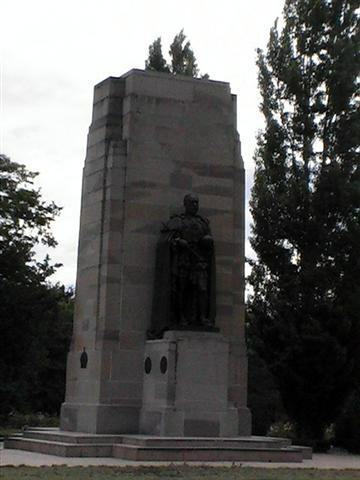 In any case our first tour today was to be the Australian War Memorial and we set off just after breakfast. Across the Kings Avenue Bridge over Lake Burley Griffin we stopped briefly at Kings Park, the best place to see the National Carillon, a 50m high tower that allows the sounds of 55 bronze bells to drift across the lake. The Captain Cook Memorial Water Jet is also in Lake Burley Griffin. Located in the Central basin of the lake, it is directly in front of the National Capital Exhibition at Regatta Point. The jet sends water to a maximum height of 147 metres, pumping it from, and returning it to, the lake. The exit velocity of water leaving the nozzle is 260 kilometres an hour and about 6 tonnes of water is in the air at any one time, discharging about 500 litres per second. It was built to commemorate Captain Cook’s discovery of the east coast of Australia and was inaugurated by Her Majesty Queen Elizabeth II. there were an awful lot of people waiting to get in ahead of us, especially children on school field trips. The Walk of Remembrance is in some beautifully landscaped gardens and we wandered along the path for a while reading some of the commemorative plaques. John’s Dad had been in the Royal Australian Engineers in New Guinea and we finally found a plaque that could have been from his squadron. Finally, the War memorial opened its doors and we were among the crowd that surged through the entrance. Just inside is the Commemorative Courtyard, surrounded by the Roll of Honour where the names of every one of the 102,000 Australian Servicemen and women killed in war since the late 19thcentury are recorded, and leading to the Hall of Memory and the Tomb of the Unknown Soldier. In front of the Hall of Memory is the Pool of Reflection, crowned by the Eternal Flame. Inside the Hall there are 15 beautiful stained glass windows looking down on the Tomb. 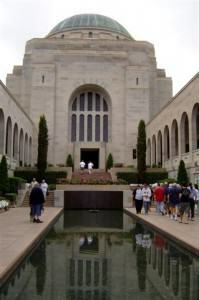 In 1993 the remains of an Unknown Australian Soldier, killed in France in the First World War were brought home and interred in the tomb in the centre of the hall. This unknown Australian represents all Australians who have given their lives for their country during wartime. There were several visitors and a tour group inside the hall and for the most part, there was silence. Those who did speak did so in hushed voices. We moved from there into some of the galleries, starting with the First World War. The displays and exhibits were striking. If not original equipment they were, at the very least, faithful and intricate reproductions covering such well-known places such as Anzac Cove and Gallipoli among others. The next gallery was World War II and it was in here that we found a fantastic array of displays including a recreation of a Japanese prisoner-of-war hut; it was fascinating and terrible moving, man’s inhumanity to man. The Aircraft Hall was spellbinding with so many full-scale replicas of aircraft that flew in the Second World War, a gun turret from a Lancaster bomber, and a model of the German V1 flying bomb. In Anzac Hall we actually experienced a World War II night bombing raid in the Lancaster bomber named “G for George”. With a huge screen in front of us and sound effects in surround-sound we could almost believe that we were in a real air raid. It makes one realise just how terrifying the real thing is. Still in Anzac Hall, we moved over to the model of a Japanese midget submarine and, again with a screen and sound effects, sat through the Japanese midget submarine attack on Sydney. It’s all history now but few people realised just how close we came to a full-scale attack and if those enemy sailors had succeeded in their mission a lot more than 23 lives would have been lost. There are vast sections where personal items such as letters and journals are kept as well as newspapers of the time. The other galleries are not quite as extensive and it was mentioned by one of the guides that the galleries for conflicts since 1945 were still under construction. 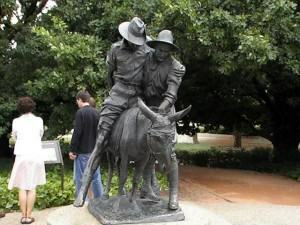 We read about Australian troops in such places as Gallipoli, Borneo, the Kokoda Trail, El Alamein, in Korea and Vietnam, particularly Long Tan, and we learned what life was like for those who waited at home. Today was a very humbling experience and one I would thoroughly recommend. 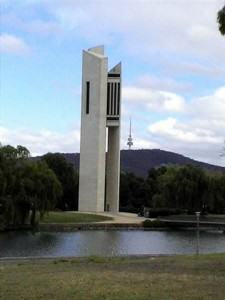 We left the Memorial after 4 hours and stopped at Menindee Park for lunch by Lake Burley Griffin where we heard the gentle bells of the Carillon. The soft sound drifted across the water complementing the peaceful surroundings. Surprisingly, there weren’t many people in the park, a few joggers and one or two people out for a stroll but we were the only picnickers. Not that we minded, it was nice not to have a crowd of people around us. After lunch we were off to the Royal Australian Mint where more than 2 million Australian coins are made every single day. There is a machine where you can actually make your own $1.00 coin and, of course we had to try it out. We saw other coins being made as well as medals and even saw the Mint’s new robots in action. It was fascinating to watch them in their very precise movements. 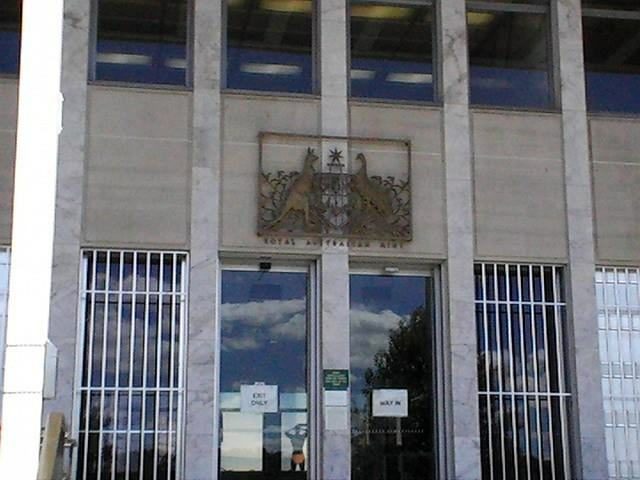 The Royal Australian Mint was officially opened in 1965 and holds a place in history as the first Mint in Australia not to be a branch of the Royal Mint in London. Since opening, the Mint has produced over 14 billion circulating coins. It was stressed to us when we arrived that while entry was free there would be no free samples handed out! Drat! I was a little surprised at the security, though. My backpack, containing only my cameras, was searched and when I asked if it would be better to search bags when visitors were leaving I was told that any would-be thieves are easy to spot by the way their bags are too heavy to carry! It’s nice to know that the Security officers have a sense of humour. We didn’t stay long at the Mint, only about 90 minutes and from there we drove up to the Red Hill Lookout for some spectacular views of Canberra before calling it a day and heading back to camp. 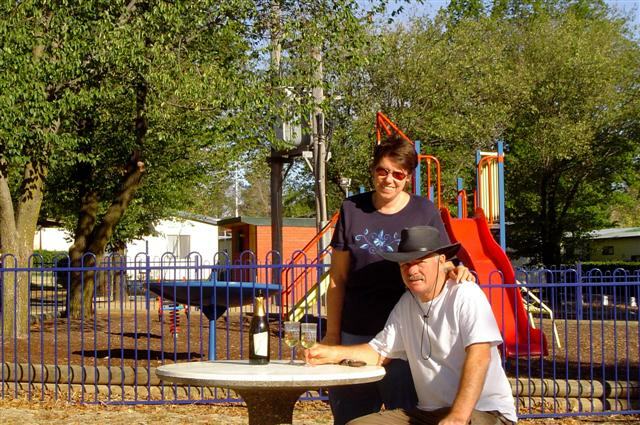 We took the “scenic route”, some several kilometres out of our way, to Tuggeranong where we stopped for a coffee but it had been a full-on day and we were both pretty tired. I think if we’d had an auto-pilot in the car we would have been asleep before we reached camp but I wouldn’t have missed today for anything. spiral climb around a central drum which is Gallery 1, Sports Quest. F1 or V8 racing is not for the faint-hearted! We started with the F1/V8 simulator, theTrivia Track where John “drove” the racing car according to the instructions on the screen in front of him. Now John is a very good driver but as far as Formula 1 or V8 racing goes he should stick to walking. He crashed so many times I think the machine was getting frustrated! From there we moved on to a bicycling robot called Questo. The object was to see how fast we could make him pedal. There was a walking machine (how fast can YOU walk?) that had us both almost running, a ball pitching machine (I guess we won’t be making the big league this year! 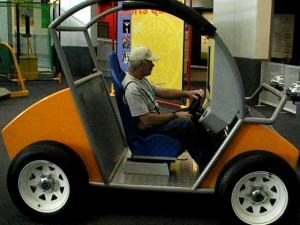 ), and a skateboard machine. Now that was interesting! I discovered that it’s not as easy as it looks and I have a whole new respect for the kids at our local skate park! How do they stay on those things? John managed it a lot better than I did but even he said it wasn’t easy. We moved on to Gallery 2 and found Sideshow – the Science Behind the Fun. John went on the 6-metre free fall slide and we both hit the virtual roller coaster known as the Track Attack. I waited on the mezzanine for John to make his free-fall and it happened so fast that I almost missed him! And as for that roller coaster, well what can I say. I don’t like roller coasters at all and even knowing that I could stand up and walk away at any time didn’t help! Watching the screen as we went up and down and around on our virtual ride only reinforced my feelings about the real thing! Only for the truly adventurous, I say. John, of course, loved it. Gallery 3, known as Mini-Q, is for 0-6-year-olds but believe me we would have if we could have! In Wavelength, Gallery 4, we photographed our frozen shadows, played a harp using only beams of light, visited Hologram Hall, and played with waves through music, colour, ripples, reflections, and vibrations. 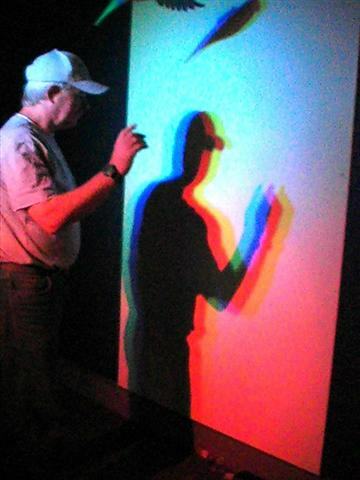 It was fascinating, we even got to create coloured shadows and we were amazed by the holograms. Was it real or all just illusion? You would have to visit and decide for yourself. It’s a dangerous world out there! In Gallery 5 we found the Awesome Earth where we photographed a lightning strike, experienced an earthquake in a house simulator, and viewed volcanic eruptions, Tsunami’s, and cyclones. Our simulated earthquake was absolutely amazing! Furniture fell over, cupboard doors flew open and the contents spilled out, windows shattered and all while the whole room shook mercilessly. The effect was spoiled, for me, at the end when the broken window repaired itself, the cupboard contents went back into the cupboard and the doors shut, and the furniture stood itself up! After all that we needed a coffee and we made our way to the café where there is a sign on the wall with a quote from Albert Einstein that reads: “Play is the highest form of research”. No truer words were ever spoken. Gallery 6 is called Top Secret where we entered the world of secret agents with a Licence to Spy. We were given a scenario and then set about collecting intelligence using codes, hidden cameras and microphones, laser beams, and satellites. We did a bit of safe cracking and practiced the art of disguise, all in an attempt to save the world from evil forces. To say we were successful goes without saying; we’re still here, aren’t we? We tried to be just like James Bond but were probably more like Maxwell Smart! In Gallery 7, called Strike A Chord, we learned the science of music. We conducted a virtual orchestra, had a musical massage, and learned the differences in acoustics. A staff member, Andrew, showed us how to make our voices sound like Jabba The Hut and Alvin and the Chipmunks! We spent more time laughing than anything else, John as Jabba was a scream and he said that my Alvin was hysterical! Alas, we’d come to the end of the galleries and the only way out was through a kaleidoscope – it was slowly spinning around and the colours reflecting off the mirrors inside made my head spin! 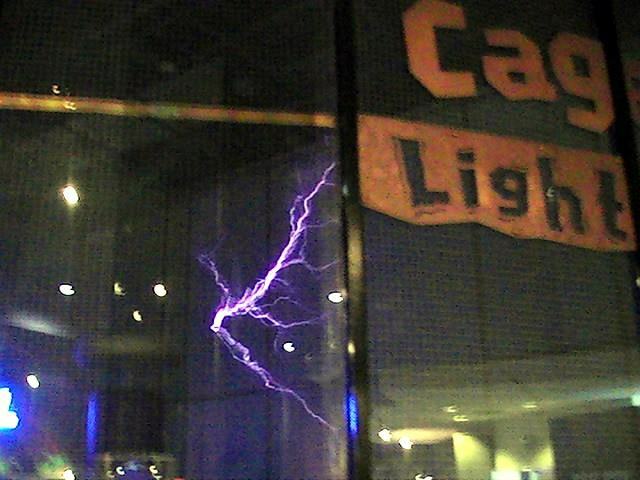 Questacon makes learning fun. As the brochures say, it provides an entertaining and educational experience all in one and it is one of the most popular attractions for school groups, families, and all visitors to this remarkable place. We had over 4 hours of fun and games and could easily have stayed another 4 hours! We left Questacon and drove around to Bowen Park beside the lake for lunch. The magnificent trees in this park are even more spectacular in spring when they are all in blossom. 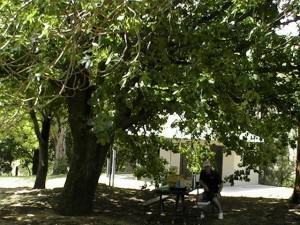 We found a seat in the shade of a big old tree and relaxed while we had our picnic lunch. We’d had such a wonderful time at Questacon but we really needed to sit down for a while. We might have been a couple of kids all morning but it does catch up with you after a while! Our lunch finished, we decided to visit Parliament House and what a spectacular building! It is a brilliant design and its beauty is outstanding. 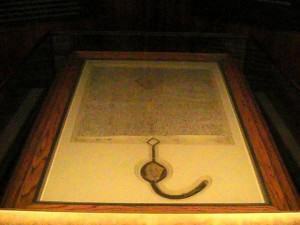 From the 81m high flagpole, with a flag that is bigger than a double decker bus, to the display featuring one of only 4 surviving issues of the Magna Carta signed by King John at Runnymede in the year 1215, this building is a must-see. There are portraits of all the Prime Ministers since Federation, the original Commonwealth of Australia Constitution Act (1900), the Great Hall tapestry, and 23 hectares of spectacular gardens. Over a million people a year visit Parliament House and we were proud to be just 2 of them. Even the security checks at the entrance were no inconvenience. Inside there is a marvellous marble staircase leading to the upper level. We wandered around the halls for over 2 hours but decided against going in to the public gallery of the Senate Chamber. While it might have been interesting to see our elected officials at the business of running the country in between insulting each other, we had other plans for the afternoon. 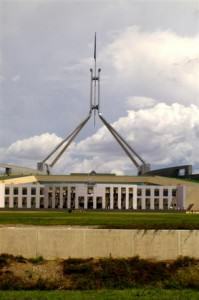 Those plans included a visit to Old Parliament House and how were we to know that our other plans were going to be changed by forces beyond our control. Old Parliament house is but a short walk from its newer replacement but certainly no less interesting. It was officially opened by the Duke of York, later King George VI, in 1927. There is a statue of his father, King George V, in the forecourt along with huge photos of 2 very famous modern day Australians, Astronaut Andy Thomas and Princess Mary of Denmark. We walked through the old Senate Chamber and the National Portrait Gallery. There were more portraits of past Prime Ministers and a lovely painting of our current PM, John Howard, and his wife, Janette. In the lower level, what used to be the basement, we discovered the Police Gallery and what a truly interesting place that turned out to be. 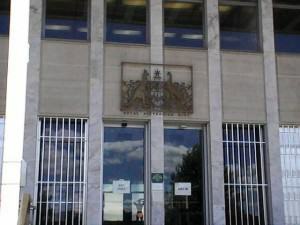 We saw displays on many of Australia’s most terrible crimes and how they were solved and stories of some of our most infamous criminals and how they were eventually brought to justice. It was fascinating. We left the building and wandered over to the Senate Gardens but some rather ominous clouds had rolled in while we’d been inside Old Parliament House. We had planned to visit the National Gallery but the last thing we wanted was to be driving on unfamiliar roads in heavy rain. It was always possible that the storm would go around us and as we ummed and ahhed about what to do a few drops of rain fell. And then the heavens opened and by the time we reached the car we were soaked through. The torrential downpour made up our minds for us and the National Gallery would have to wait. We returned to camp for some dry clothes and by that time the storm was past but it was late in the afternoon so we decided to call it a day and have an early night. In spite of acting like a couple of kids for half the day, we’re really not as young as we used to be! The next day was another busy one! And you thought we were on holidays! 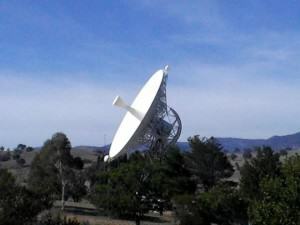 We set off early this morning for Tidbinbilla and the Canberra Deep Space Communication Complex. My second visit to this fascinating place, although my previous visit had been more than 25 years ago, and John’s first but we enjoyed ourselves so much here that I have a feeling it won’t be our last visit. The road crossed over the Murrumbidgee River at Point Hut crossing and from that point on we were into rolling hills and farmland. Along Paddy’s River Road and onto Discovery Drive, we still hadn’t seen anything even remotely suggestive of a deep space communications complex. A large sign warned us to turn our mobile (cell) phones off so we knew we were getting close but where were those “dishes”? We drove a little further along the road, came up over the hill, and there they were, 4 large dishes and 3 smaller ones. Fantastic! We were a little surprised to find that the complex was in a valley, surrounded by hills. We would have thought that it would be up high but as we were to learn, it was in the valley to avoid interference from other signals and transmissions, such as radio, television, transmitters of any kind. And that included mobile phones, hence the sign warning us to turn them off. The complex is part of NASA’s Deep Space Network, one of 3 facilities in the world. The others are in Goldstone, California and Madrid, Spain. Through huge radio antennas, the dishes, these stations provide 2-way communication with unmanned, interplanetary spacecraft that are exploring our solar system and beyond. One of the dishes, DSS46, was originally located at Honeysuckle Creek and has a proud history of space exploration. Operating for over 40 years, it returned the first images of Neil Armstrong walking on the moon. We wandered around looking at the displays for quite a while. There were some genuine artefacts, including a piece of moon rock brought back to Earth aboard Apollo 11, as well as some life sized replicas, and a lot of photographs. 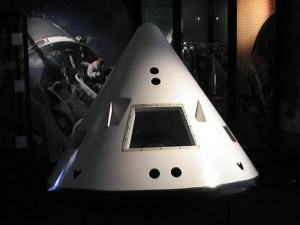 There were also videos and interactive displays. We spent some time talking with a couple of fellows who worked there. Astronomers? I don’t know but they cheerfully answered all our questions, in some detail I might add, and I got the feeling that they were each a deep well of information that we hadn’t even tapped. I’m sure that, time permitting, they would both, just as cheerfully, have chatted on for hours. We stopped for coffee in the Moonrock Café and sat by the windows overlooking the tranquil gardens and rolling green hills before moving on to a model of the Mars Rover. An amazing piece of hardware is the Mars Rover. 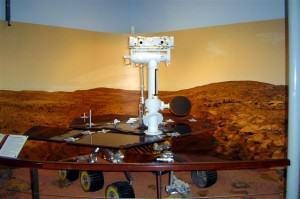 With a life expectancy of just 90days, the little rover was still going strong, exploring Mars and sending invaluable information back to Earth, after 2½ years! My car should be so good! There are actually 2 little rovers running around, as it were, on the Martian surface. They’re called Spirit and Opportunity. Looked more like Wall E from the movie, to me! One of the fellows we were talking to explained the rovers, and how they work, in great detail to us. It was very interesting. Back amongst the displays we saw stardust (it looks like frozen smoke), more rocks brought back from the Moon, part of the heat shield of Gemini X, and even a piece of Skylab. We learned that the Universe itself is not expanding, only the matter inside it. (Does that mean that eventually the universe will be full to bursting?) There are displays and models of the Galileo spacecraft that explored the planet Jupiter in the 1980’s and the Magellan spacecraft that made the trip to the planet Venus in the 1990’s. 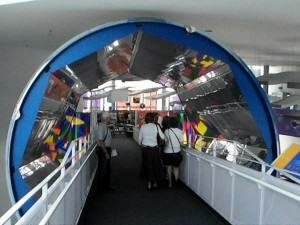 Another of the displays shows the International Space Station, a project involving 16 countries. When completed it will be 108 metres (354 feet) across and 88 metres (289 feet) long and will have over 1 hectare (2.47 acres) of solar panels to provide electrical power. 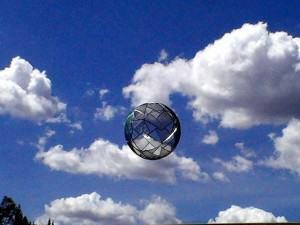 It orbits the Earth at an altitude of 400 kilometres (248 miles), circling once every 90 minutes. Designed primarily for research, it is from here that the first manned mission to Mars will be launched.The Tidbinbilla Valley is 35 kilometres (22 miles) southwest of Canberra. The Complex began operations in December 1964 and was officially opened by then Prime Minister, Sir Robert Menzies, in March 1965. The DSS46 antenna is 26 metres (85 feet) in diameter and the largest antenna is DSS43 with a diameter of 70 metres (230 feet). It was close to lunchtime before we left the complex but our farewell to the stars is only a temporary one. Armed with a slew of web addresses, everything from CSIRO to NASA, we’ll be back among the stars on a regular basis. We stopped at Point Hut Picnic Ground, beside the Murrimbidgee River, for lunch under the shade of some beautiful big trees. It seemed to be quite a popular stopping place, especially with cyclists. I don’t know what those big trees are but they’re magnificent. It was very warm and there wasn’t a breath of air. The trees gave us plenty of shade but what I wouldn’t have done for a little breeze! A little cloud was building to the south and it looked like we could be in for another storm. Personally, it couldn’t come soon enough for me! Lunch over, we headed for the city to the National Gallery of Australia. There were some buses in the forecourt and it looked like there were a few school field trips taking place. Some great sculptures outside the Gallery caught our attention for a few minutes and one in particular was really quite something. 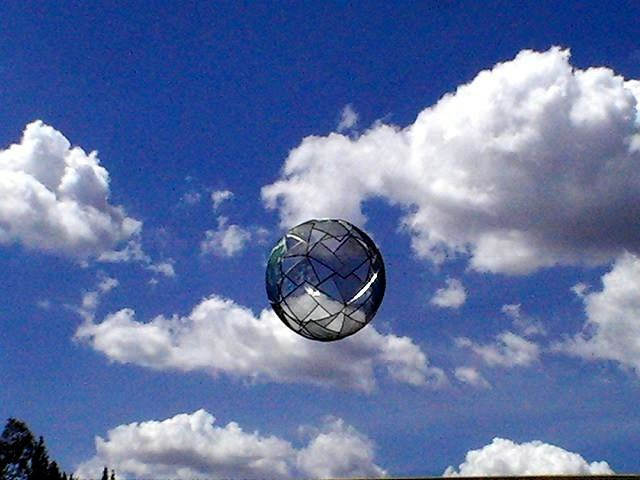 It looked like a huge glass ball hanging in the air. We had been told that when the sun shone on it from a certain angle it was like a myriad of rainbows. We were obviously there at the wrong time of the day! There was another amazing sculpture near the entrance. I have no idea what it was supposed to be or who the sculptor was but it was quite striking in black and red. We waited until all the students from the buses had entered the Gallery before we went in. Some truly marvellous works of art greeted us but because of Copyright laws we weren’t allowed to photograph anything inside. One of the most popular paintings is Jackson Pollock’s controversial “Blue Poles”. There was quite a crowd gathered around it. Purchased by the then Labor Government, under Prime Minister Gough Whitlam, in 1974 for AUD$1.3million, today it is worth $200million. I’m no art critic but, personally, I think the best I can say is that it is . . . interesting. We wandered through several of the different galleries but didn’t stay too long. Mostly we quite liked what we saw however there were some sections where we truly weren’t that impressed. As I said before, I’m no art critic but when you see a canvas painted white – nothing else, just white – you have to wonder what exactly art is and why in the world it is worth so many millions of dollars! When we left the National Gallery it was still hot and there was no sign of the threatened storm. We decided to go for a drive up Black Mountain to the Telstra Tower. There is no place in Canberra where you can’t see the tower and our stay here wouldn’t have been complete without a visit to it. What an impressive sight! Inside, on the lower level, is a scale model of the tower as well as a fascinating exhibition called “Making Connections” that illustrates the history of telecommunications in Australia. 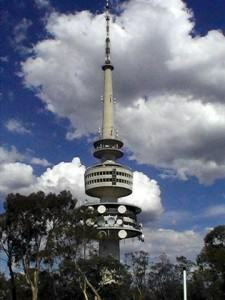 The tower rises 195 metres (640 feet) above the summit of Black Mountain and offers 360° views of Canberra and the surrounding countryside. Visitors can take advantage of 2 open viewing platforms or an enclosed viewing gallery. The self-supporting concrete circular shaft also carries two levels of technical equipment for radio communication purposes. Opened in 1980, Telstra Tower also provides essential communications facilities for the National Capital. It was getting late and it had definitely been a long day so we wearily made our way back to camp. I just wanted to sit down and put my feet up for a while. Actually what I really wanted was a long soak in a nice hot bubble bath. In a caravan park? Right. Even John’s suggestion of Chinese for dinner was met with less than enthusiasm. No, dinner, a glass of wine, and early to bed for me. This night I very much doubted that I could manage anything else. After the last few days of go-go-go we thought we needed a quiet one. Yeah, right! The National Museum of Australia beckoned. We’d heard a lot about the museum and I was really looking forward to it. “The National Museum is a place where we can all explore Australia’s great stories. 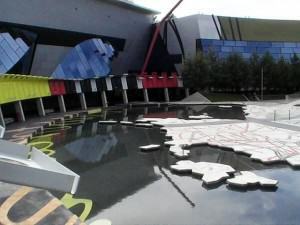 It celebrates the land, nation, and people of Australia by exploring the events, issues, and people that have shaped our nation.” (reprinted from National Capital Attractions). There are 5 permanent exhibitions from the First Australians Gallery, featuring the histories and cultures of Aboriginals and Torres Strait Islanders through to Nation, an exhibition of all things uniquely Australian. The Garden of Australian Dreams caught our attention at the front entrance with its map that so brilliantly weaves together a standard map of Australia with a map of Aboriginal boundaries. There is a yellow line through the garden depicting the border of Western Australia. The line represents the Treaty of Tordesillas, a line inscribed on the globe in 1494. It separated Spanish and Portuguese interests in the new world but was later used to divide the Australian continent. Once inside the museum proper we entered the Circa, a revolving theatre where we watched 3 short videos, revolving around to each screen, on the land, the nation, and the people. It was fascinating and prepared us for our visit through the galleries and exhibitions. The first gallery we visited after Circa was Eternity where we saw a fossilised skull of a Tasmanian Tiger, a hologram of an emu and the skeleton of a Diprotodon, among other things. The Diprotodon is an extinct marsupial, the largest marsupial ever recorded. From there we wandered into The First Australians gallery where we willingly took part in a photo shoot for a magazine. Ah, stars at last! Our 15 minutes of fame! That aside, the exhibits here were really interesting and the few replicas had been painstakingly constructed with amazing attention to detail. We were totally immersed in indigenous culture, dance, and music. We saw Pukamani Poles from the Tiwi Islands, north of Darwin. These were part of ceremonial performances including song and dance, and represented death and re-birth. And some great Aussie icons to be found! 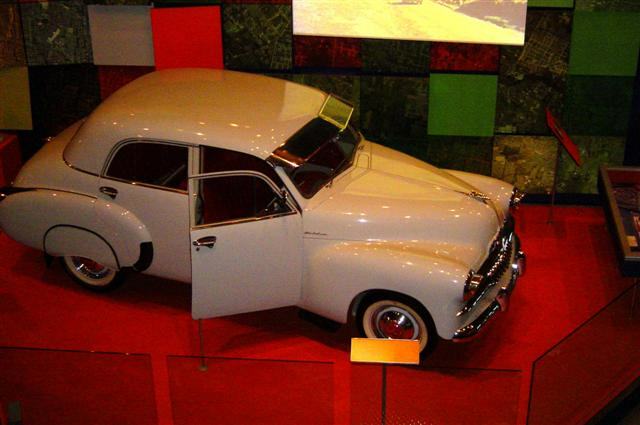 In the gallery called “Nation” we found Aussie icons, including the FJ Holden, and one of the first caravans. I remembered the FJ, my Dad had one. So did John’s Dad. In fact, I think most Dads of Baby Boomers were proud owners of the FJ Holden. We wandered around this gallery for a while and I came across an interesting piece of text perched on an easel. Written here was an explanation of some of Australia’s unique colloquialisms. Expressions I had heard all my life and thought I knew what they meant and their origins. I discovered in many cases I was wrong! By this time it was early afternoon and we’d reached the point where we’d seen enough museums and galleries for a while so we decided to leave and have some lunch somewhere. But as we were leaving a strange looking car caught our attention and we had to stop for a look. 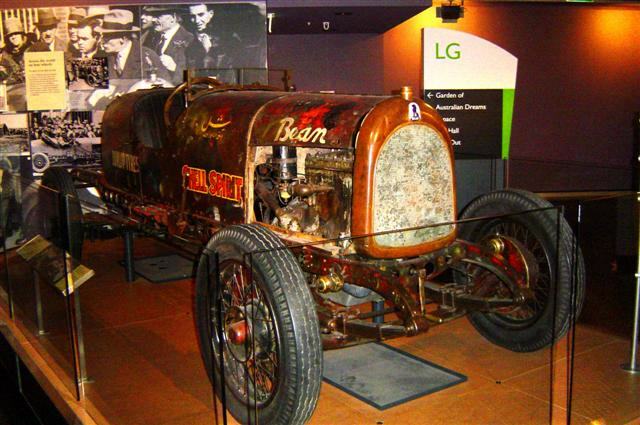 “The Bean” set a new record for crossing Australia in 1926. Yes, 1926! Francis Birtles and Alec Barlow left Darwin in the early hours of October 22nd, 1926. Stopping only to refuel and grab a few minutes sleep they raced south along outback roads. 8 days and 13 hours later they arrived at the Elizabeth Street Post Office in Melbourne. A remarkable feat for that day and age! And so we left the National Museum and drove to a picnic spot on the banks of the Molongolo River. We expected another quite lunch stop but there were a few power boats and some water skiers making good use of the river on this beautiful day. We sat and watched for a while before making our way back to camp to start packing up. The end of our holiday has arrived and tomorrow we start heading home. 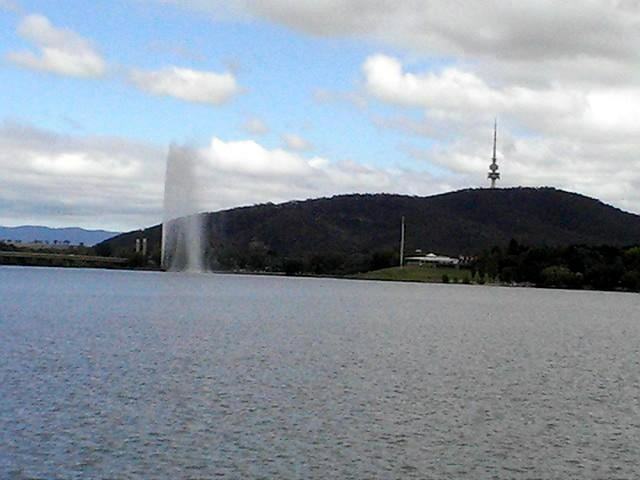 Canberra is a terrific place with so much to see and do but with only 4 days we didn’t even scratch the surface. One thing is for sure though, if ever we come back we’ve promised ourselves next time we’ll relax a bit more. And if you believe that, I’ve got a bridge over Sydney Harbour I could sell you!